For the uninitiated team racing is all thrills and spills and there’s not a foil or a wing sail in sight. Races last typically 8 – 10 minutes round a short course in colour coordinated boats with 3 boats on each team, manoeuvring to get their team into a winning combination of 10 points or less. The discipline really pushes all the sailing skills; to win you need to excel at boat speed, boat handling, starting, tactics, rules and teamwork. The event also adopts the ‘swiss league’ format for the first stage of the competition, which pitches teams on equal or similar number of wins against each other to ensure the best racing for everyone. Then come Sunday lunchtime the top 8 advance to the quarter finals and the magic of the event really kicks in as the remaining competitors and spectators crowd the grandstand and shoreline to cheer on their heroes and friends in the knockout phase of the contest. Races are umpired on the water with boats penalised during the race so there are no protests ashore; the team that wins across the line is the team that takes the glory. As ever the cream of UK team racing will be in attendance. Birdham Bandits from Itchenor Sailing Club were last years’ winners and have continued their winning ways on the UK circuit and will certainly be in contention – their team includes supercrew ‘Tobytastic’ Toby Lewis who is now the most decorated Endeavour Trophy winner. Last years’ runners up have switched allegiances from Royal Thames to Oxford & Cambridge Sailing Society; they are a formidable and young team who include Yachts and Yachting’s amateur sailor of the year Fiona Hampshire. Other names who regularly make it to the knockout phase and are back for more include 2013 winners Wessex Exempt, Southampton Male Voice Choir, Paddington Bears, Itchenor SC, and Society Exodus. Amongst the Itchenor SC team is Olympian Ben Saxton who will be taking a break from his Nacra cat sailing to compete in the Wilson, as he has for many years. Ben comments ‘I love the Wilson and want to come every year. 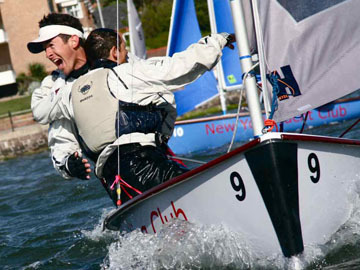 It is an easy way to get great boat on boat racing against some awesome sailors. Combine that with brushing up on rules and it’s a great thing for my Olympic campaign’ Other Olympians competing include Luke Patience and Stu Bithell who will be competing for the ‘Northern Clydes’ and hoping to again reach the knock out stages as they did last year. As we head into the 69th Wilson Trophy attention is already very much focused on the 2019 event which will be the 70th anniversary event taking place on the 10th, 11th and 12th of May 2019. West Kirby always go flat out for the anniversary events; the 50th saw 50 teams take part with two race courses and the 60th saw the event switch from 2 to 2.5 days which has stuck ever since. Plans are taking shape for 3 full days of racing, international themed evenings and even a UK/Overseas Team Racing Challenge preceding the event on the 9th May. The hope is that many teams that have graced the event in the past will return to renew old rivalries and to pitch themselves against the new generation of Wilson Trophy competitors. The 70th Wilson is set to be a huge event which will hopefully set the famous trophy on course to go from strength to strength for another 70 years and beyond.